The Practice Transition Readiness Assessment™ is a tool that objectively measures the readiness of a professional practice and its owner(s) to transition out for maximum value. In order to assess whether a practice will transition for a high value, its current condition in this regard must be compared to the ideal transition event. This questionnaire highlights the critical areas that must be addressed to ensure that the transfer of a private practice’s value is done to avoid the most common situations that destroy value. Results-Based Transition Planning™ as a subject is broken down into 9 specific facets and each of these facets must be in a certain condition of completeness and correctness for the whole plan to be considered optimum. You are implementing a written comprehensive practice transition plan. You have a team of knowledgeable advisors. You have an organized, trained and very productive staff. 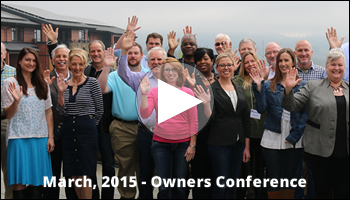 Your practice runs on systems and expands without your involvement. The income of the practice is abundant and up-trending. The property of the practice is protected and optimized regarding value. Your financial readiness to transition out the practice is secure and certain. You are fully mentally and emotionally ready to move onto the next chapter of your life. The transaction is structured optimally, efficiently and on your terms for maximum transition value. 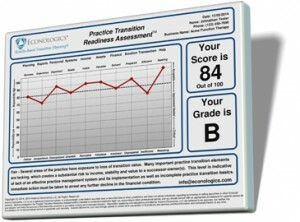 Now, you can objectively measure your progress on the path to full practice transition readiness. The Practice Transition Readiness Assessment is a questionnaire of 100 questions for a professional private practice owner. The questions are designed to validate areas that are doing well and suggest improvements for areas that are not doing well in your practice transition. The answers are analyzed, scored and plotted on a graph so, you can see the overall practice transition readiness at a glance. The index score ranges from 0-850, with a score over 700 approaching the acceptable range. This questionnaire will take about 15-20 minutes to complete, and your answers will be held in confidence.